by Jeff Mapes Follow OPB April 2, 2018 5:05 p.m. | Updated: April 3, 2018 6:59 a.m. This is the second Oregon gun initiative put forth following the February school shooting in Parkland, Florida, that left 17 dead. 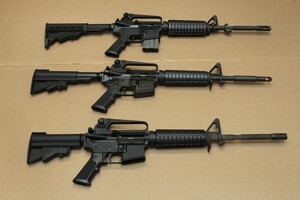 Last month, group of ministers and students introduced a measure to ban the sale of military-style firearms in Oregon. The gun-storage measure has backing from several people — including two who lost relatives in the mass shooting at the Clackamas Town Center mall in 2012 — who have been active in gun politics in Oregon. Jenna Yuille, whose mother died in the attack, and Paul Kemp, whose brother-in-law was shot and killed, are chief sponsors of the gun storage bill. Also sponsoring the measure is Henry Wessinger, an heir to the Blitz-Weinhard brewing fortune. He is helping raise money for the effort, according to Jake Weigler, a political consultant working on the measure. Weigler has worked with a consortium of groups seeking tighter gun laws. He said he expected several of them to be active in helping to qualify the gun storage measure for the ballot. Yuille said the Clackamas Town Center shooter had stolen an unsecured gun from a friend’s house. Rep. Bill Post, R-Keizer, has been speaking out against the proposed ban on military-style weapons. He said he hasn’t yet seen the gun storage measure, but expressed skepticism. Both gun measures have been filed late in the year for initiative petitions. Each still has to obtain a ballot title — something that frequently requires review by the Oregon Supreme Court — before they can gather the lion’s share of the 88,184 valid signatures required to qualify for the ballot. The deadline for turning those signatures in is July 6. Weigler said his group plans to pay petitioners. Backers of the military-style weapons ban said they will only use volunteer petitioners.